Thursday 29 November 2012 the event Ruimtevolk Expedition 2012 took place. Ruimtevolk (‘spatial folk’) is a well-read Dutch online platform for spatial and urban design professionals. 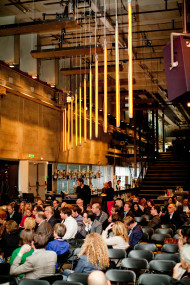 Venue Trouw Amsterdam, one of Amsterdam’s cultural hotspots, was packed with urban professionals, policy makers, and researchers. The event theme was “new ownership in spatial planning”. Since The Mobile City has done research, published, spoken, and organized events about ownership, and the notion now is appearing elsewhere more often, we obviously were very keen to find out how ownership is informing urban design professionals. Architects, planners, city servants and policy makers feel the urgent need to reformulate their own role and added value in the context of multiple crises and chances: financial crisis, a decline in expert knowledge, increasingly vocal clients who want to have an active role in the design process, no more easy one-off interventions, the perceived need put corporate and social responsibility in practice. In a rapidly changing playing field urban design professionals must search for new business models, new processes, new products, new publics, new tools, and so on. There is an increasing acknowledgement among professionals of doing people-centered design rather than space-oriented design of cities. New stakeholders have to be found and mobilized to collaborate in solving and managing urban issues (creating what I would call ‘unlikely coalitions’). Questions of representation and power must be addressed: who represents and what is represented in current urban design practices? Who are the people we are building for? Who can have a say in this and in what ways? Whose ideal city is it? There is a growing sensitivity for digital media technologies and online ethics as potential ways to strengthen citizen ‘ownership’ over their urban environment, yet there is still little critical discussion about smart cities. Following the morning keynote talks there were a number of (rotating) breakout sessions about themes like: new entrepreneurship, new social challenges, from living consumer to prosumer, temporariness as permanent chance, sustainable neighborhoods, creative coalitions in rural areas. I dropped in near the end of the session about new entrepreneurship (unfortunately I could not attend the plenary morning talks by Willem Schinkel and Ronald van den Hoff due to teaching obligations). Five speakers briefly talked about their project or research, followed by discussion. Sebastian Olma made a passionate argument that we should stop using new technologies to further automate work and optimize business revenues but instead use these technologies to create new meetings and elicit serendipity. As founder of a think tank on urban development Olma has been exploring the concept of urban interfaces to talk about working environments that act as catalysts to kickstart innovation power in other economic sectors. Olma did a research about Seats2Meet, a creative flexible workspace initiated by Ronald van den Hoff (one of the other speakers in this session). In Olma’s own words, “S2M … is the most successful Dutch provider of coworking spaces based on a rather unique business model: coworkers do not pay for their workspace financially but socially, i.e., by sharing information, knowledge, expertise.” Calling S2M a “serendipity machine”, Olma concludes that the concept seems to work well in bringing together individual freelancers and strengthen creative entrepreneurship through creating critical mass. This reminded me of the problem that large public ICT projects are never commissioned to small and medium businesses but to large companies, which arguably means unfair competition (at least that was the case in the Netherlands a few years back, I don’t know about the situation now). Legalities for procurement need to keep pace with changes in work. Networked ways of working can aid small-scale entrepreneurs in forming ad-hoc consortia that often are more flexible and knowledgeable than top-heavy companies. In this conversation about technologies Simon van Dommelen, one of the people behind the Noorderparkkamer (perhaps best known for the awarded Noorderparkbar), a DIY initiative in the underused Noorderpark in Amsterdam, made an important point by saying that we shouldn’t rely too much on high-tech in neighborhoods where many low-educated people live. In his view it is rather elitists to talk about various new media interventions when a large portion of the population is left out, either because they have no access or not possess the media literacy to use these media in useful ways. The issue of representation – both in the sense of who represents, and what is represented? – remains ever relevant as we turn to digital media as potential tools and solutions for urban issues. Simon further told that a group of people are working to establish an organization run by local citizens, the Noorderpark Trust. This Trust tries to turn the Noorderpark into a permit-free zone, which means that within certain limits the Trust is free to develop activities like building (temporary) constructions, organizing events, and publicly serving food and drinks. That could be made possible because the Trust is in fact an initiative for and by the people. Precisely because of this loosening up of clearly defined ownership, many more bottom-up initiatives are possible. An interesting point I picked up from this session was Simon’s remark that Dutch artist Jeanne van Heeswijk (whom we interviewed for our ‘Ownership in the Hybrid City’ study) refuses to apply for ‘livability’ subsidies because that is ‘charity money’ from municipalities and housing corporation without real strings attached. Her social design projects help to increase the value of real estate in a particular neighborhood, and therefore constitute a veritable business model for urban development instead of being mere social aid, so she wants to get funded through that route (see for example her recently awarded project in Liverpool). In this session it also became clear that municipalities are struggling with their own role. How can they reposition themselves in this fast-changing field and shifting relationships? One of the speakers suggested that governments should act as brokers between various stakeholders, instead of managing processes in a top-down way. This also means letting go of control. 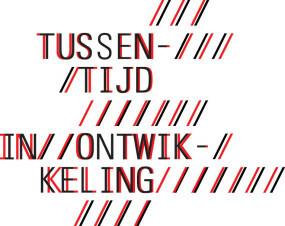 The speaker pointed to recent publication by Trancity about urban design as a transformative force (see here – in Dutch). Johan Vellinga, director of Início office for urban innovation and management, told about a crowdfunding project they developed for housing corporation Havensteder in Rotterdam. All renters from Havensteder get a quarterly cheque worth €5 to €10. Together citizens can save up and use these cheques for a collective event or service in their neighborhood. First, they need to activate the cheque; second, they have to organize the backup of others and develop a plan to save for; third, they have to organize an event for which they get real money if it complies with the conditions of the project fund. According to Vellinga about 35% of people are saving and using their cheques. Advantages of this project are that it stimulates civic participation by allowing people to organize themselves around projects, it creates transparency in budgeting, and sets up a database of inspiring projects that can be followed by others elsewhere. Vellinga pointed out a very important issue, to which none of the attendants had a ready answer. How to deal with the minority standpoint and not just let majority rule? Despite Vellinga calling the project “crowdfunding for civic participation” I wondered whether receiving ‘free money’ in the form of cheques are really the way to go to strengthen citizen commitment. ‘Free’ does strange things to people, behavioral economist Dan Ariely notes in Predictably Irrational (2008) . On the one hand, “things that we would never consider purchasing become incredibly appealing as soon as they are FREE!” (p. 50). Cheques then could indeed be a way to entice citizens to commit to their neighborhood. On the other hand Ariely observes that ‘free’ may lead to a substitution effect: “The critical issue arises when FREE! becomes a struggle be­tween a free item and another item—a struggle in which the presence of FREE! leads us to make a bad decision.” (p. 52). This tension suggests that there could be a risk that the ability to spend ‘free money’ becomes a placeholder for more in-depth and intrinsically motivated involvement with the neighborhood. Ariely says free is attractive because there is no risk of loss (p. 54). Applied to this case free money could mean there are no strings attached. When nothing is at stake gratis could take away a sense of urgency. Getting involved is not a risky endeavor and therefore may not be challenging and satisfying. Well, these are just assumptions I am making. It would be interesting to develop a method to research how various interventions actually affect different modes of citizen engagement. Up to now I guess many if not most of the claims (including our own) that digital tools can strengthen ownership rest on rather flimsy evidence. Every area is permanently ‘under construction’. Human and space are intertwined: planning and landscape produce one another. Relational planning entails the liberation form a yoke. Relational planning is surfing on uncertainty. Well thought-out temporary destinations are the main road to sustainability. Temporariness always has a duration. Every destination is a temporary destination. The practice of temporary use is a matter of civilization. Temporarily planning differently points to a new treaty between human and place. If all goes well, temporariness is always in: temporariness always has the future. I wondered how powerful the notion of temporariness is when it is not opposed to permanence but used as a catch-all phrase for uncertainty, open-endedness and temporal dynamics. If everything becomes temporary, does temporariness become temporary too? If I recall correctly Derix replied that temporariness acts as a testing and selection mechanism: what works stays, what doesn’t work goes away. Another presenter in this session was Tom Bergevoet from Temp.architecture, whom we worked with for our Designing Social Cities of Tomorrow workshop. 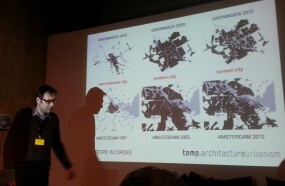 Bergevoet began with a historical perspective on temporary use of space in Amsterdam. A few centuries ago the construction of the Amstel church was halted due to a financial crisis. Out of necessity it became the later much praised Amstelveld, a large empty square in the city center. Another case is the temporary airport ELTA that was built in 1919 to the north of the city in Buiksloterham. From 1920-1936 it became the factory of Fokker aircrafts. At this moment it is a creative workspace. Similarly, unfinished new neighborhood IJburg only became well-visited and popular thanks to temporary urban beach Blijburg. Following years of expansion the city is now imploding, Bergevoet said. Empty spaces emerge. Traditional goal-oriented planning (‘eindbeeldplanning’) looks at the final picture, requires large one-time investments, replies on prefixed zoning plans, and tends to think on a large scale. All this should be traded in, according to Bergevoet, for a process-oriented planning strategy that uses the factor time and departs from small steps within a predefined bandwidth that opens up room for improvisation(‘startbeeldplanning’). It makes failure less costly and speeds up innovation. Shifts in supply and demand can quickly be dealt with, and factors in planning like finance, legal issues, participation and spatial interventions can be better accommodated. 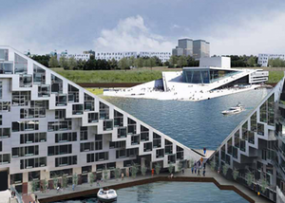 Bergevoet gave the case of the project Open Lab Ebbinge in Groningen. This is an empty space at the edge of the city center next to a shopping mall suffering from a decline in attraction. When local shopkeepers initiated a plan to do something temporary with that space, municipality facilitated this by issuing out a temporary building permit and subsidizing finances. The location sported pavilions, bars and restaurants, a playground, an urban beach and a space for ad hoc events. The project faced the question of legal ownership: who owns the land, who can have access to it, how public is this space really? According to Bergevoet 5 years was too short to earn back investments (prompting the remark by civil servant Jurgen Hoogendoorn that the space should have been squatted, since no-one is going to force you to leave). In my view temporariness is a sensible point of departure for urban design. It can be a way to overcome one of the main challenges that we observed a few years back: the vastly divergent temporal dynamics between the worlds of urban and digital media developments. Temporariness is a given in digital media development where every innovation is in a state of ‘perpetual beta’. The iterative release cycles commonly found here of rapid prototyping, releasing early versions, harvesting user feedback and making frequent incremental updates and upgrades can be an interesting model for the urban design world to experiment with. Closing talk: a silent revolution in urban design? Jan Rotmans – professor in transition management at the Erasmus University Rotterdam, and co-founder of Urgenda – closed off the day with a talk about systemic change. In his words we don’t witness an era of change but in a change of eras. Occurring once everyday 150 years the process of rapid modernization was the last total systemic change we had. This present change involves the structure or fabric of society and the erosion of (semi-)public institutions, which creates the breeding ground for radical innovation. Rotmans sketched a broad picture of a series of radical transformations in the way we conceptualize, organize and manage society: from linear to cyclic, from vertical to horizontal from top-down to bottom-up. This shift affects all tiers of society. On a macro level there are crises in finance, energy, resources, climate; on a meso level there are crises in regimes and institutions; on a micro level there are crises in professional expertise. According to Rotmans these crises are a blessing in disguise. Creative citizens are creating a silent revolution where they are breaking out of the system and engage in alternative social experiments. Like standing in the eye of a hurricane, many people are not aware of these developments or are downplaying them. Rotmans then turned from this broad outline to specific examples of what he has been working on in the world of real estate. He made a plea for new criteria to establish the value of neighborhoods that include green places and clean air. In some of his projects multiple definitions of value are combined, for example turning unused urban surfaces into mixed solar panels/aerosol absorbents/advertising spaces (see some of his projects). While Rotmans’ sweeping introduction certainly was inspiring, it remains debatable whether such a revolutionary change is actually occurring. Furthermore, will these series of changes come to replace the status quo or merely be a (slight) modification of it as just another reincarnation of capitalism? Rotmans himself in any case did not seem to notice the irony of the fact that he himself and his projects are very much part of the very same ‘old’ institutional way of working. He is a professor at the university, former employee of the governmental National Institute for Public Health and the Environment (RIVM), who is closely collaborating with large investment companies, European Union, state departments and municipalities. Frankly I do not see anything radically new in the process of urban design here. The processes and products Rotmans showed seem a far cry from the whole bottom-up DIY/co-creation/maker revolution he sketched out. Conclusion: what about the smart city? Although Ruimtevolk Expedition 2012 paid little direct attention to digital media technologies as potential drivers of new ownership, the themes addressed implicitly rested on many of the changes associated with digital culture. Surprising to me – but then again I’m biassed – was that there was hardly any talk at all about the smart city. Strange, considering the fact that many cities across the globe are reallocating budgets to that area. This should concern urban design professionals. Spatial folks too need to be part of the discussion about smart city making, instead of leaving it up to the technology folks. Briefly about smart cities: more and more cities develop ‘smart city’ policies as part of their (economic) agendas. In collaboration with technology companies and knowledge institutions, cities attempt to efficiently organize urban processes like energy and water supplies, mobility patterns, air and environmental quality, and public decision making by using sensor and network technologies. These visions promise to improve the quality of urban life by delivering more efficient, convenient and personalized services with the aid of digital technologies. But as we noted elsewhere, smart city visions have spawned much criticism, among others for being a top-down approach and ignoring the role of citizens as driving agents and neglecting ‘ownership’ of other stakeholders. Luckily there’s a short contribution by Roy van Dalm that casts a critical eye on smart cities in the Ruimtevolk Yearbook 2012 (pp. 164-166). The yearbook was handed out to all participants at the event closing and is available for free here. In his article Van Dalm presents two current controversies about Smart Cities. The first is what he calls “Big Brother Versus Jane Jacobs”. On the one hand there is the top-down master-planning, risk control and surveillance in smart cities. On the other hand – and smart city visions tend to forget about this – there is the spontaneous self-organization from below that Jane Jacobs wrote about. I agree with Van Dalm’s criticism, yet I feel it is a partial story. Ironically, I believe that on a deeper level Jacobs’ fascination with systems thinking is shining through in today’s smart city visions. In The Death and Life of Great American Cities Jacobs famously calls cities “problems in organized complexity” with many “variables… interrelated into an organic whole” (p.433) . Both views thus rest on the same (modernist) preoccupation with considering cities essentially as problems of maintaining order, although obviously their definitions and approaches differ. The first departs from tech to manage functions and services, the second departs from people’s self-organization. The question that needs to be asked is what other possible views of the city are left out? Attempts to capture the singular essence of cities risk ignoring the innate multiplicity of urban life. In addition to the focus on order, the city can for example also be understood as a place for experimenting with different identities, a place for meeting strangers, for public deliberation and forming collectives beyond old sociological categories, as well as a place for sensory stimulation, playfulness and emotional affect. Those views are largely ignored in smart city visions. This is why the debate needs to be broadened to include the perspectives of urban anthropologists, artists, designers, architects and so on. The second controversy, which Van Dalm calls “Space Versus Place”, is the one between order and messiness. Referring to Adam Greenfield and Ajit Jaokar, he says that people like messy places with character, not abstract spaces . I guess this is yet another lesson that urban professionals could take from the world of digital media: the future of urban design may be about designing for messiness . Ariely, D. (2008). Predictably Irrational: The Hidden Forces That Shape Our Decisions. New York: Harper Collins Publishers. Jacobs, J. (1992). The death and life of great American cities (Vintage Books ed.). New York: Vintage Books (originally published in 1961). This view of space as abstract and place as concrete is problematic however, see e.g. Massey, D. B. (2005). For Space. London ; Thousand Oaks, Calif.: SAGE. For example Chalmers’ et al. make a case for ‘seamful design’ (pdf) in ubiquitous computing; and Dourish and Bell pay attention to the ‘messiness’ of computing.